Charles Chalmers, in his days as an independent producer in Memphis, leased his product wherever he could. 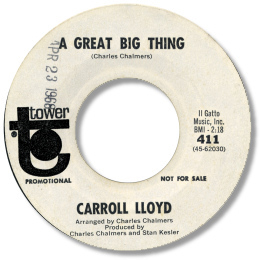 Terry Felton, appeared on Revilot, Rudolph Taylor on Mainstream and these sides from Carroll Lloyd came out on Tower. He has a good enough baritone voice, with some handsome growling touches, and the toe-tapper “I Can’t Fight It No Longer” with its subtle hint of funk is a good example of his approach. 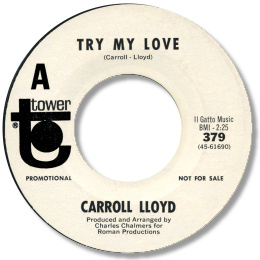 Try My Love is even better, a tasteful ballad with gentle horns and a meandering harmonica – very good country soul. Jones’ version of A Great Big Thing may not match Barbara Brown’s superb cut but the song is so good that I can always listen to it- particularly when the musicians are so good. Chalmers tended to use Sam Philips and Lyn-Lou studios but it is clear that some of the AGP crew moonlighted for him. Sheer class. These 2 45s are very worthy southern soul.